Add Multiple playlist and schedule them in advance as per your need. The most Appreciated feature about piSignage is the ability to add multiple playlists and display them as per schedule. The scheduling is done in advance and the playlists are deployed automatically at scheduled time as per the setting. If there are no playlists (additional playlists) scheduled to play during a particular time, then the default playlist will be displayed. Let us explore the feature with a Sample example of a restaurant menu . Let us say you have to display three different playlists during differnt times of the day. Third playlist rest of the time, a generic menu playlist named PL-regular. Note - Make sure all the players running the menu displays are assigned to a single group. In the above example players displaying menu are added to the group named Grp1. Also make sure you have your playlists with required assets ready. First Sign in to your piSignage account , go to Groups in the left panel and select any group. In this case Grp1. (Refer screenshots below). From the dropdown menu choose PL-regular as default playlist. Now that we have added all 3 playlists required We have to schedule the playlists to be displayed during specific time. 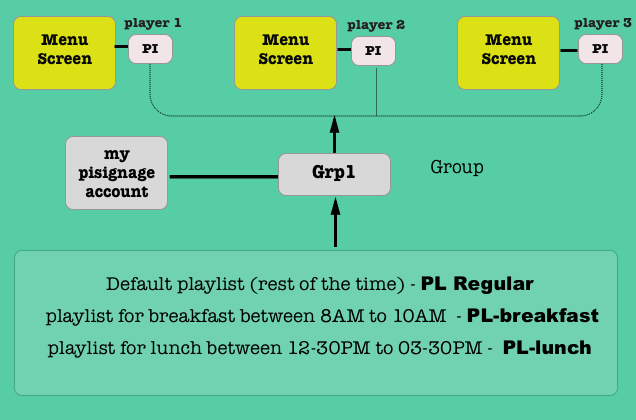 As PL-regular playlist has to be diplayed all the time , except for breakfast and lunch hours, we have added it as default playlist for the group, ie it will be displayed when there are no Scheduled playlists. Now click on the scheduling Icon in front of the added playlist PL-breakfast. You will see a pop up box which has 3 scheduling options ie date range, selected days and specified time. These three scheduling options can be used in combination to create Custom scheduled displays. We will explore in detail about these options in another writeup. In the above example starting and ending time for the PL-breakfast is 08:00:AM and 10:00:AM respectively. Save this setting.Repeat the same for PL-lunch playlist scheduling it to be run between 12:30:PM and 03:30:PM. Now deploy the group and the Menu display is ready, with appropriate playlist automatically deployed as per schedule. Thus you do not need to login to your piSignage account and deploy the right playlist each time. Unless you edit the deploy options , The scheduled playlist has precedence over default playlist while being deployed. Among the scheduled playlist, the precedence moves from top to bottom. 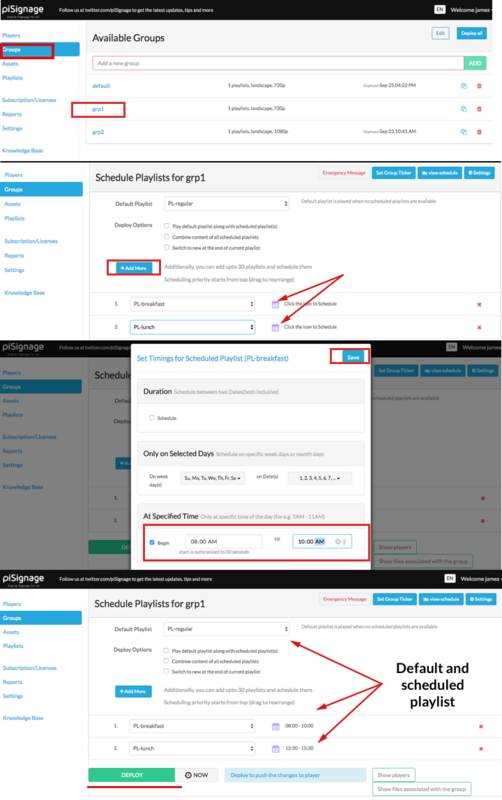 ie if there is an overlap in scheduling time of 2 playlists , The playlist placed at the top will have precedence and will be displayed first. The playlist below will only be deployed after the scheduled time of the upper playlist is completed. Now there are couple of factors to be taken care for this scheduling feature to work properly. These situations arise due to the lack of hardware clock embedded in the Raspberry Pi. Read the article for a work around. Assets like videos,Images are locally stored and displayed. For assets like WebLinks, Streaming links to be displayed you need a working Internet Connection for the content to be freshly fetched each time, Though the cached content may also be shown. Keeping all your screens in perfect Sync. implementing a simple display solution with a single playlist. Also in the given example The Displays have to be manually powered off after restaurant operating hours and switched on the following day. You can avoid this using TV_OFF feature in piSignage.